Storm drain inlet protection products provide added protection to your construction site, job site, or industrial facility. Featuring a combination of biodegradable and synthetic products, these storm drain products sit in front of drains to filter water discharge or runoff before it enters a drain system. Depending on your site's conditions, requirements may be long term or temporary. If you have questions about storm drain products, give us a call at +1-772-646-0597 or request a price quote. 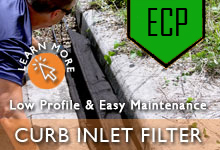 Biodegradable inlet filters are an all-natural way to control water as it flows into a drain system. Made from either straw or coir, these wattles are able to effectively retain sediment and prevent pollutants from entering a water area. Standard wattles feature a diameter of either 6", 9", 12" or 20", depending on their composition. For more information on coir wattles, check out our Erosion Sediment Control Products. Dimensions: 108" x 7" x 4"
Filter products are often used on the outside of storm drains to help separate out materials as they are flowing into the drain. In addition to this type of storm drain inlet protection, we also offer products that can fit directly into the storm drain itself. 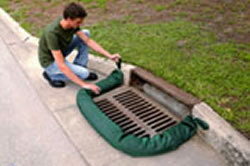 These drain guards can often attach to the outside of the drain or to the drain grate. Guards are made from a geotextile material that naturally provides filtering. 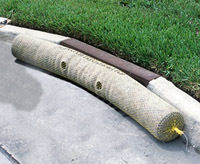 View all our available Storm Drain Guards. Questions? We can help! Call our team at +1-772-646-0597 or fill out our quote request form to discuss your storm drain inlet protection.